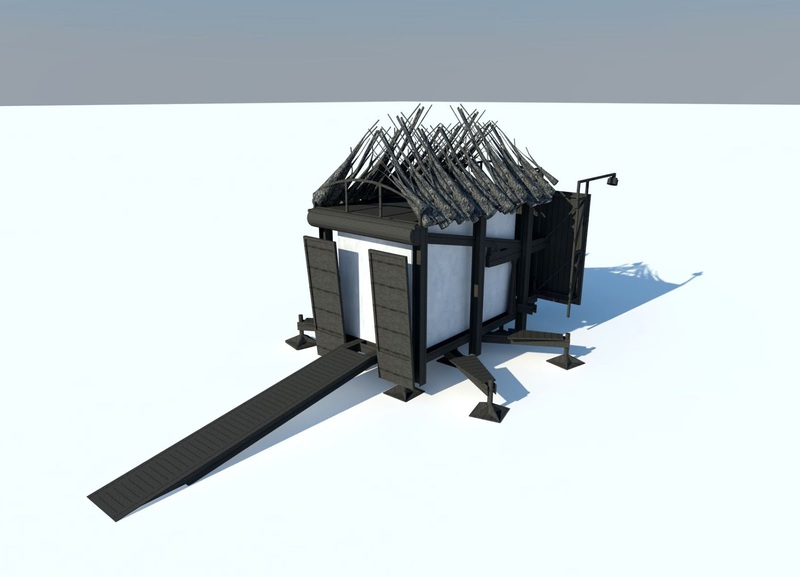 Case study of Primitive Hut by Wes Jones' and Peter Pfau for Donald McKay's Arch100 course in University of Waterloo School of Architecture. Amin , Ash. Post-Fordism: a reader. Oxford: Blackwell, 1994. Print. "Showroom of Automotive History: The Model T." The Henry Ford. N.p., n.d. Web. 8 Dec. 2012. <http://www.hfmgv.org/exhibits/showroom/1908/model.t.html>. An account of the beginning of mass production and the invention of the assembly line. This source also describes the impact of mass production, Fordism and the Ford Model T on the built environment in both Europe and the United States. A novel describing the concept of prefabrication. 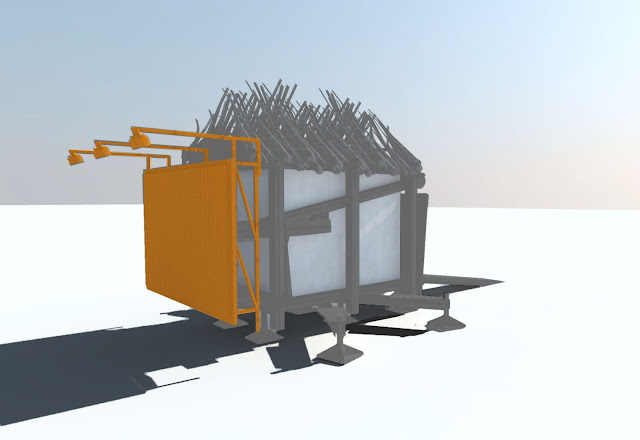 Section describing Wes Jones' use of standardized shipping containers as durable building blocks in the construction of his projects. "Brian Jungen, Selected Works." Brian Jungen: Strange Comfort. N.p., 2009. Web. 11 Dec. 2012. <http://nmai.si.edu/exhibitions/jungen/works.html>. 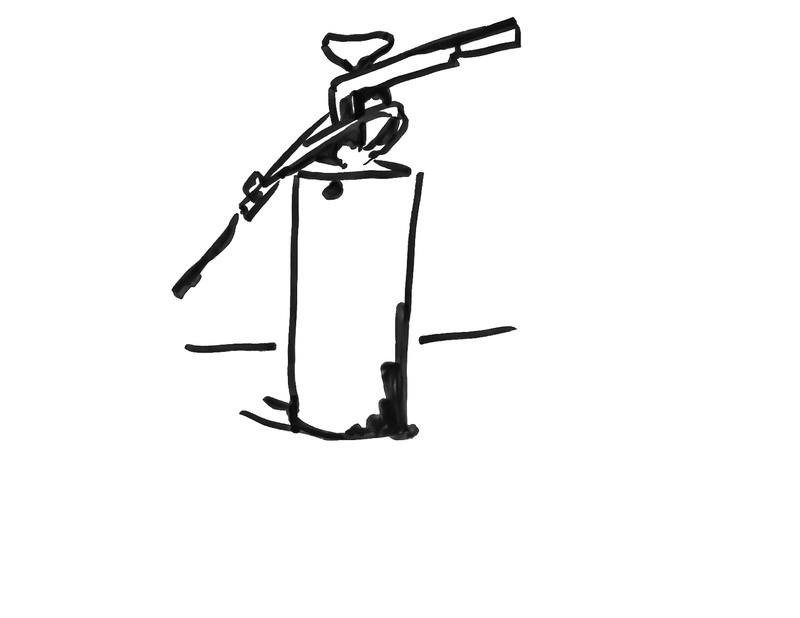 A contemporary artist’s official website. This is a related work of art to the primitive hut and the concept of a modern version of the design. Events in the News." State Library of South Australia. http://www.slsa.sa.gov.au/exhibitions/boland/WorldTLvertical.htm (accessed December 5, 2012). This source is a compilation of important events which appeared in the news from 1911 through the year 2000. Many of the incidences are accompanied by photographs of the old newspaper articles in which they appeared. This source was used in the construction of the case study timeline as it contained the complete time period we chose to include (1940s to 2000s). "Hesselink Guest Hut / Container House, 1994." Frac Centre. Laurent Pinon, n.d. Web. 11 Dec. 2012. <http://www.frac-centre.fr/collection/collection-art-architecture/index-des-auteurs/ auteurs/projets-64.html?authID=100>. The Frac Centre official website gives detailed information and background on Wes Jones’ primitive hut project and prior projects leading up to this project. All of the hardcopy information on these projects are located in the Frac Centre in New Orleans. Jones, Wes. 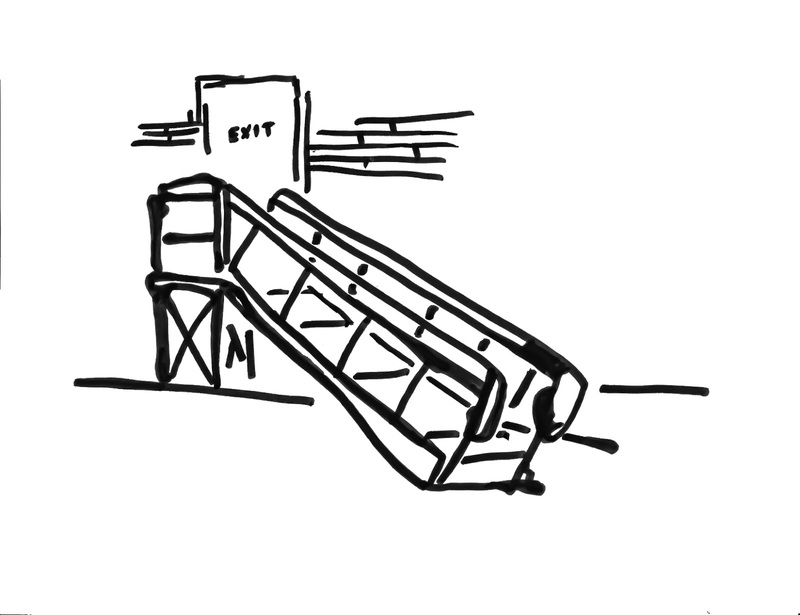 "Jones, Partners : Architecture." archilab 2008. http://www.archilab.org/public/2000/catalog/jones/jonesen.htm (accessed December 5, 2012). This webpage is comprised of an article written by Wes Jones commenting on the significance of technology to architecture. 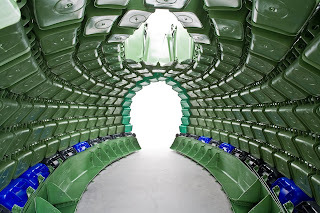 He describes how the work of his firm, Jones, Partners: Architecture, differs from other firms as they consider Architecture as technology, rather than merely using technology as a symbol for something non-technological. This source also contains the dates of important projects and publications by Wes Jones, which was of use in the completion of the timeline. Keko, Don. "Top 10 historical moments of the 1990s - National American history ." Examiner. http://www.examiner.com/article/top-10-historical-moments-of-the-1990s (accessed November 24, 2012). A list of ten significant events in the 1990s. Each event is paired with a short description and date, including the month, day and year that the incident occurred. Keko, Don. "Top Historical Events of the 1980s - National American history ." Examiner. 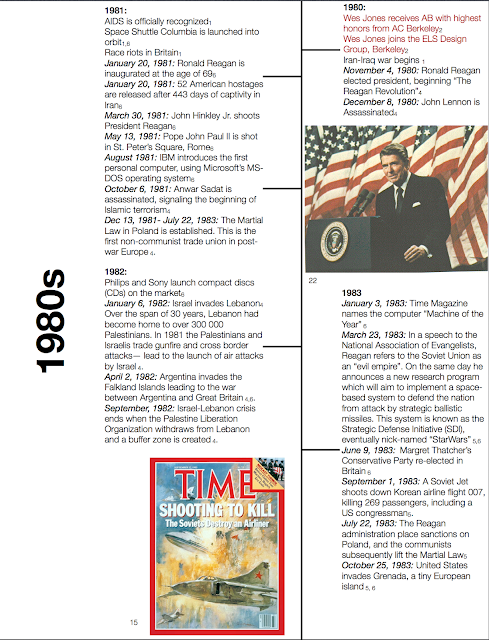 http://www.examiner.com/article/top-historical-events-of-the-1980s (accessed November 21, 2012). A list of ten significant events in the 1980s. Each event is paired with a short description and date, including the month, day and year that the incident occurred. "Love, Hate & Propaganda: The Cold War - Timeline." CBC. http://www.cbc.ca/doczone/lovehatepropagandacoldwar/timeline.html (accessed November 20, 2012). A timeline of key events during the cold war. Occurrences from 1940 to 1999 are included. Each event is accompanied by a date, including day, month, and year, a subtitle specifying the country in which it took place, and a short description. This information was utilized in our timeline as Wes Jones and his architectural choices were influenced by the Cold War and the fear manifested due to the threat imposed by technology during the age of nuclear weaponry. McCarter, Robert. 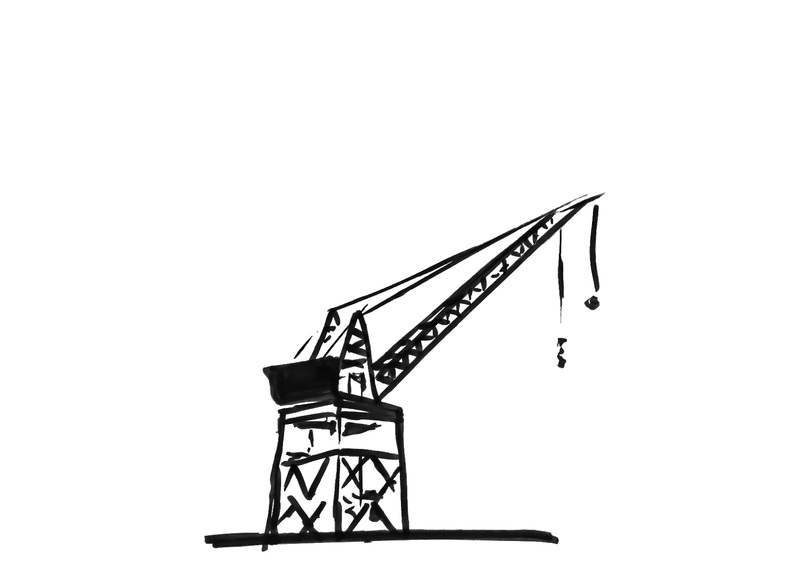 Building machines. New York: Princeton Architectural Press, 1987. A publication discussing the concept of the origin and its ambiguous and self-contradicting nature. 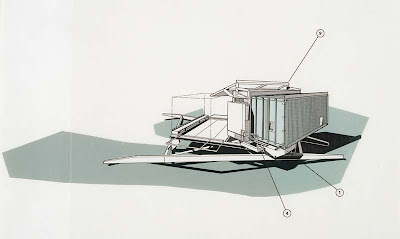 The exploration of the origin of architecture through the primitive hut by Wes Jones and Peter Pfau is also addressed. Muschamp, Herbert. "ARCHITECTURE VIEW; 'Boss' Design: A Los Angeles Sketchbook ." The New York Times. 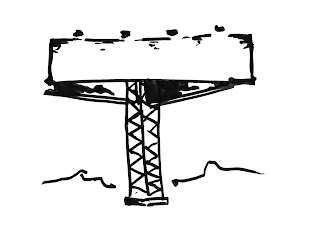 http://www.nytimes.com/1994/06/12/arts/architecture-view-boss-design-a-los-angeles-sketchbook.html?pagewanted=all/ (accessed November 7, 2012). This New York Times article comments on the ways in which Jones’ architectural choices have been influenced by technology and his view of it as a detriment to humanity. This piece describes Wes Jones as a ‘Cold War child’, which has become a reoccurring theme throughout his work. It specifies Jones’ preoccupation with technology and the combination of fear and fascination it generated during the nuclear age. The machine and Jones’ refusal to disguise or decorate it, is also characterized as an integral part to his work. 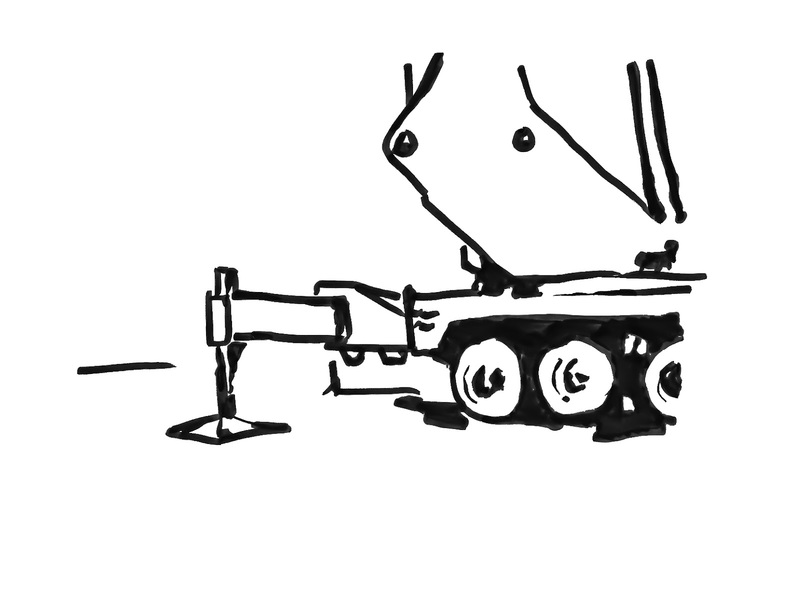 "Open-source design: Mass bespoke ." The Economist . 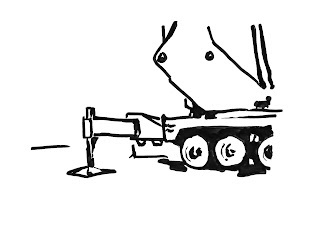 http://www.economist.com/blogs/schumpeter/2012/11/open-source-design (accessed December 4, 2012). An article outlining the growing trend in open-source design. It explains the flaws in the modern manufacturing process, and the general disservice towards both customers and designers. 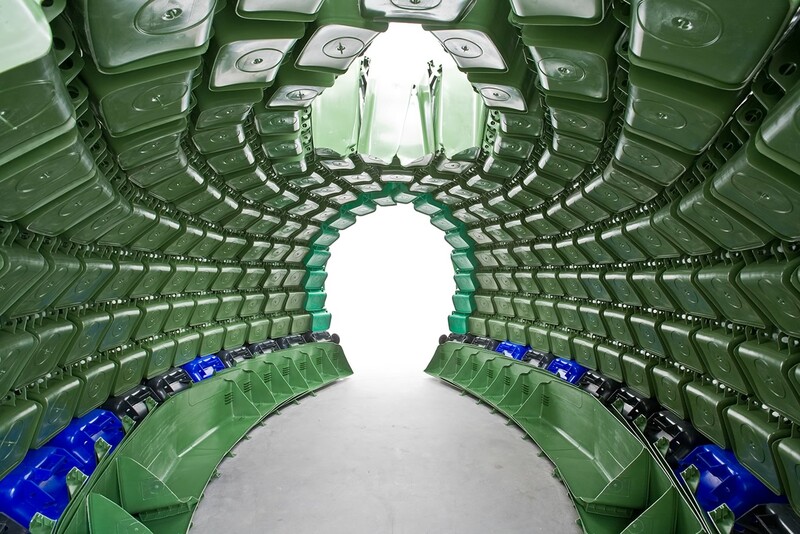 The introduction of open-source design allows customers to attain affordable, custom goods through the utilization of modern fabrication technologies. Ostwald, Michael, and John Moore. "AA - Adam's House in Cyberbia-." Architecture Media . http://www.architecturemedia.com/aa/aaissue.php?issueid=199703&article=13&typeon=3 (accessed November 8, 2012). 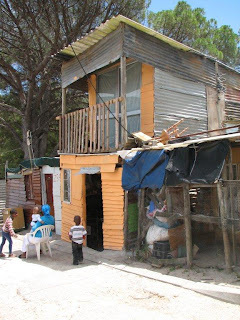 This article explores the concept of the primitive hut in the 20th century. It describes Wes Jones and Peter Pfau’s modern and technological approach to the study of the mythical origins of architectures. The authors acknowledge Jones and Pfau’s decision to challenge suburbia and their representation of the origins of architecture through the primitive hut. Ouroussoff, Nicolai. " Home Delivery’ - At MoMA, a Look at Instant Houses, Past, Present and Future ." The New York Times . 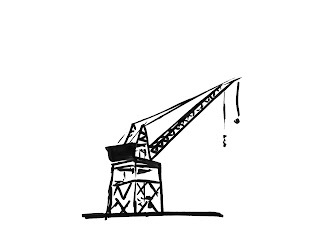 http://www.nytimes.com/2008/07/18/arts/design/18dwel.html?pagewanted=all&_r=1& (accessed November 5, 2012). An article outlining the concept of prefabricated and mass produced housing and how it has developed throughout history. The source acknowledges the invention of the assembly line, and the influence of Ford’s Model T as a readily available, affordable machine. The Model T is then compared to Le Corbusier’s description of the home as a “machine for living” . This source also includes a description of Wes Jones and Peter Pfau’s primitive huts and suggests that they indicate a dark side to the narrative of mass produced housing, symbolizing post-war nihilism and American individualism. Paddison, Joshua. 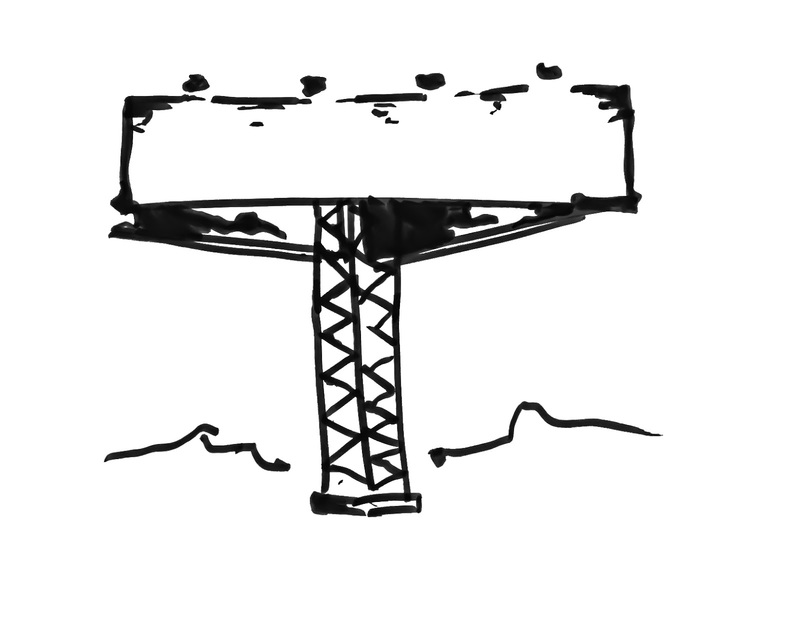 "1921-present: Modern California” Migration, Technology, Cities." Calisphere. http://www.calisphere.universityofcalifornia.edu/calcultures/eras/era6.html (accessed December 4, 2012). An article on the influence of migration on the culture in California from 1921 to present day. Pfau, Peter. "Peter W. Pfau, FAIA, LEED AP." Pfau Long Architecture. http://www.pfaulong.com (accessed December 5, 2012). The official website of Pfaulong architecture. The site includes a description of Peter Pfau’s firm, a portfolio of his current work, as well as a short biography. 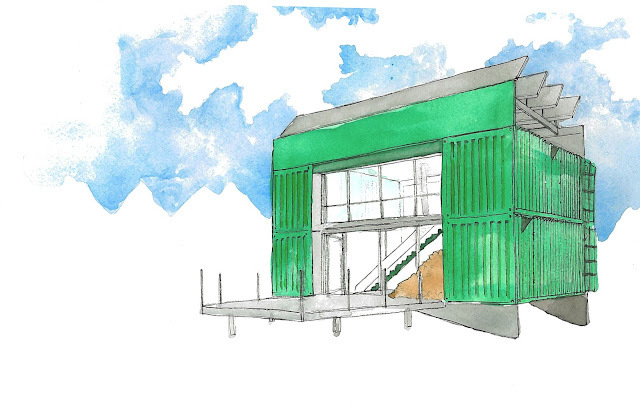 "PRO/con MOUNTAIN HUT." JONES,PARTNERS;ARCHITECTURE. N.p., n.d. Web. 11 Dec. 2012. <http://www.programcontainer.net/mountain.html>. Information from Wes Jones’ official website on his PRO/con mountain hut. "PRO/con PACKAGE HOMES." 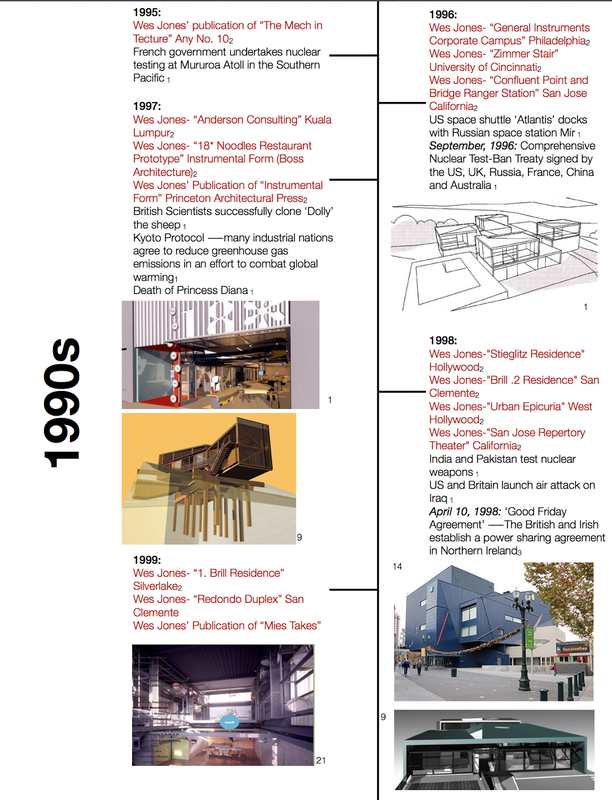 JONES,PARTNERS;ARCHITECTURE. N.p., n.d. Web. 11 Dec. 2012. <http://www.programcontainer.net/packagehomes/index.html>. Information from Wes Jones’ official website on his PRO/con Package homes. Rykwert, Joseph. On Adam's house in Paradise; the idea of the primitive hut in architectural history. New York: Museum of Modern Art; distributed by New York Graphic Society, Greenwich, Conn., 1972. This book is a description of the development of the concept of the primitive hut throughout history, with the beginnings being traced to ‘Adams house in Paradise’. 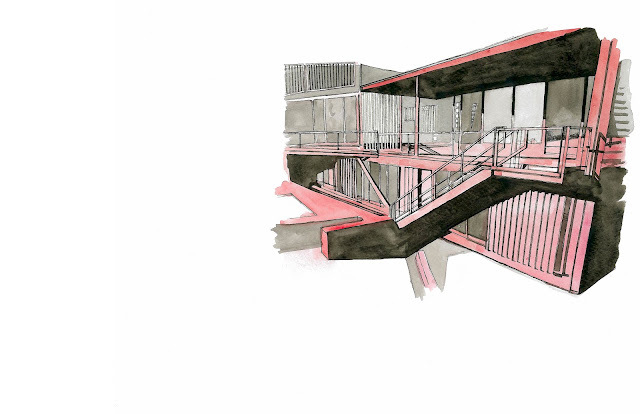 It discusses the idea of the origin and how it pertains to architecture. It also includes commentary on Laugiers ‘Essay on Architecture’ and his depiction of the first hut. Tennent, Scott, ed. Jones, Partners Architecture: El Segundo : Designs for Words, Buildings, Machines. New York: Princeton Architectural, 2007. Print. 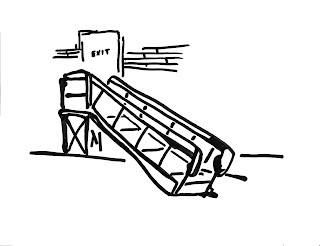 El Segundo is a publication of Wes Jones’ later projects subsequent to the primitive hut. 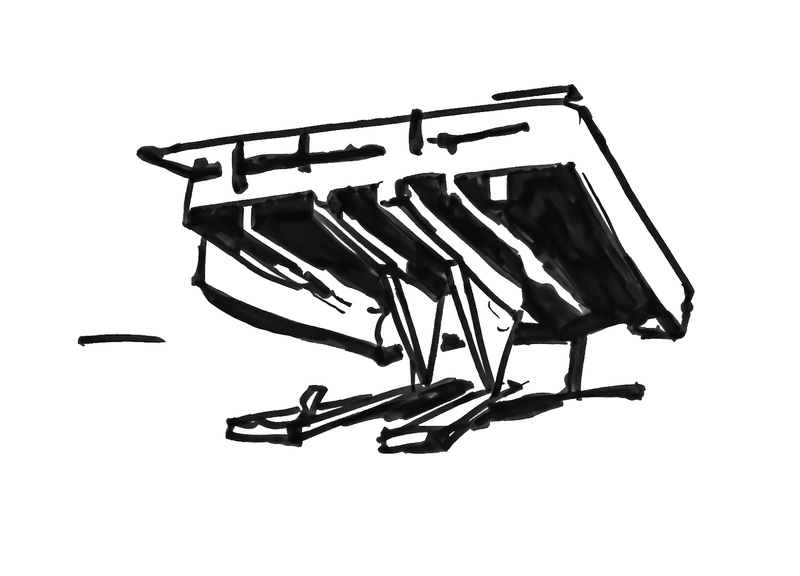 It is a good reference to his other work and illustrates references to the primitive hut concept and design. "The 80s Timeline." power house museum . 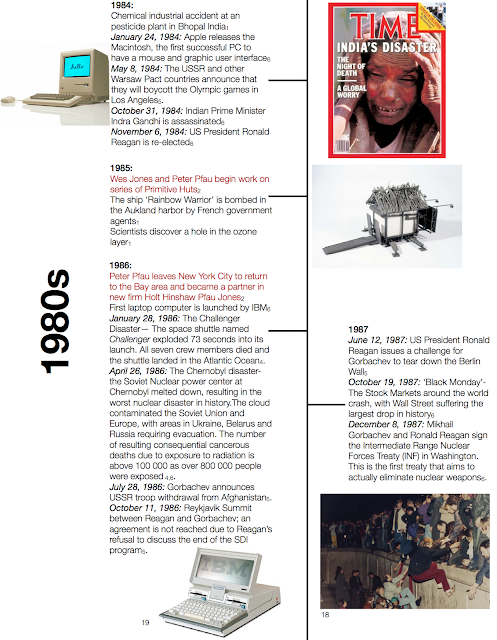 www.powerhousemuseum.com/pdf/education/80s/80s_timeline.pdf (accessed November 20, 2012). 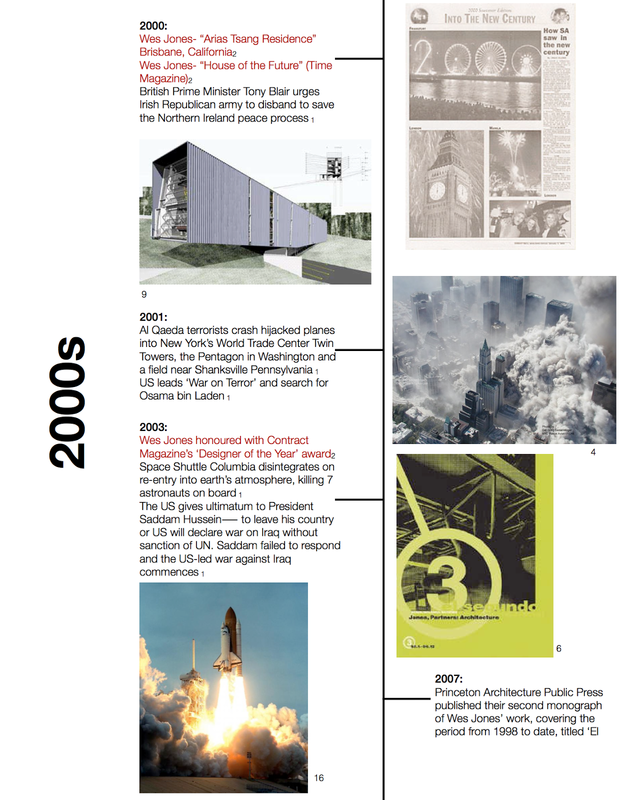 A timeline including important events concerning science and design in the 1980s. "The Space Mirror Memorial." Astronauts Memorial Kennedy Space Center. http://www.kscvisit.com/memorial.html (accessed November 5, 2012). A description if the Astronauts Memorial at the Kennedy Space Center, designed by Holt Hinshaw Pfau Jones. Tomlinson, John . 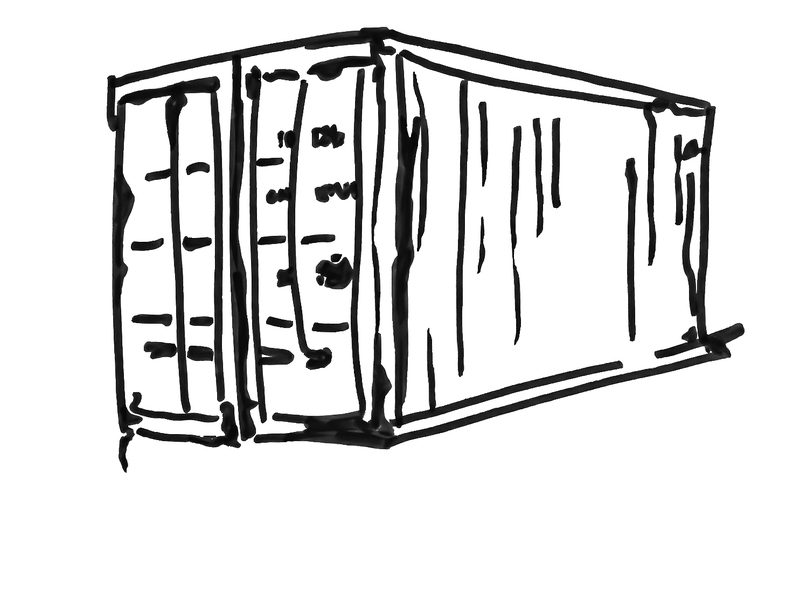 "History and Impact of the Intermodal Shipping Container." johntomlinson. www.johntomlinson.com/docs/history_and_impact_of_shipping_container.pdf (accessed November 5, 2012). 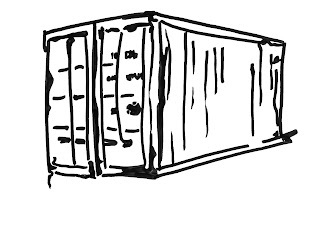 A publication on the history, development, and impact of the intermodal shipping container. The benefits of the standardization, affordability and durability of the container are discussed. Tschumi , Bernard , and Wes Jones. "What Will Our Houses Look Like? The Suburbs by Wes Jones." TIME Magazine. http://www.time.com/time/magazine/article/0,9171,996178,00.html/ (accessed November 2, 2012). 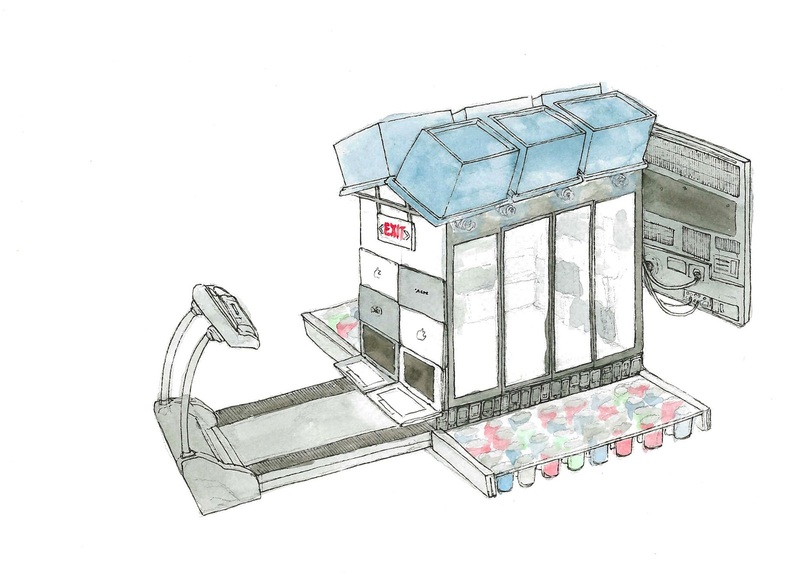 An article written by Wes Jones depicting what a suburban house will look like in 2025. He predicts that cyberspace will largely satisfy the need for setbacks and spacing from neighbors and that neighborhoods will no longer include parks or community gestures. He then goes on to describe the components of the suburban home which would be dictated by an intensely technology driven lifestyle. Warde, John. "A Short History of Hot Rods ." MSN Autos. N.p., n.d. Web. 10 Dec. 2012. <http://editorial.autos.msn.com/article.aspx?cp-documentid=435974>. An account of the history of hot rods, beginning in the 1930s through current day. The article describes the beginnings of the hot rod movement in the process of “souping up” during the Depression, to its subsequent resurgences during the 1950s and 1980s. The evolution of the culture is described from its birth in the junkyards of Southern California and popularity among youth to its current state as a money driven hobby dominated by wealthy car enthusiasts. 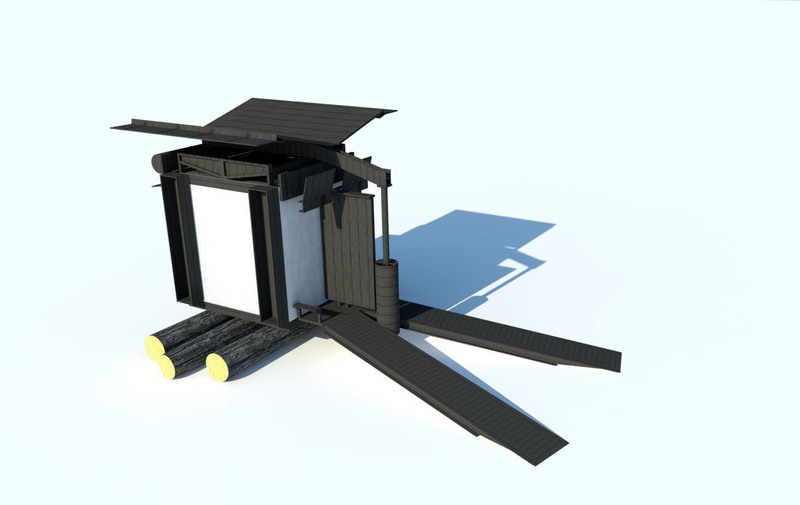 The concept of a primitive hut by Jones and Phau can be seen in the world around us today. 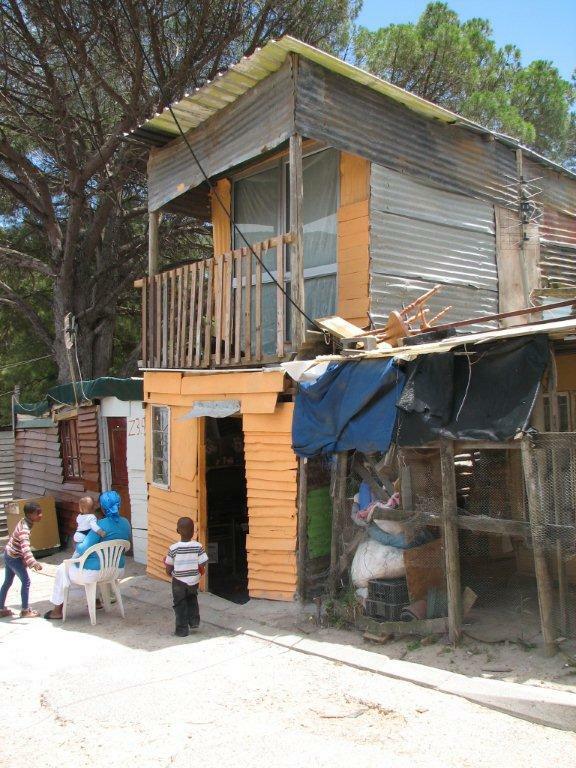 These huts often have design purposes to intrigue the viewer, or the function as homes for families. Here are a few examples of these versions of the primitive hut. 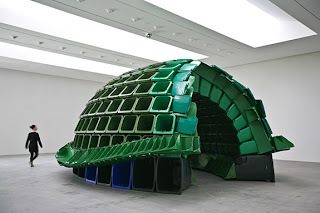 Made of industrial waste bins. The artist uses mass produced goods to make sculptures that express feelings and themes of traditional Native art in a fun, quirky, yet interpretive fashion. 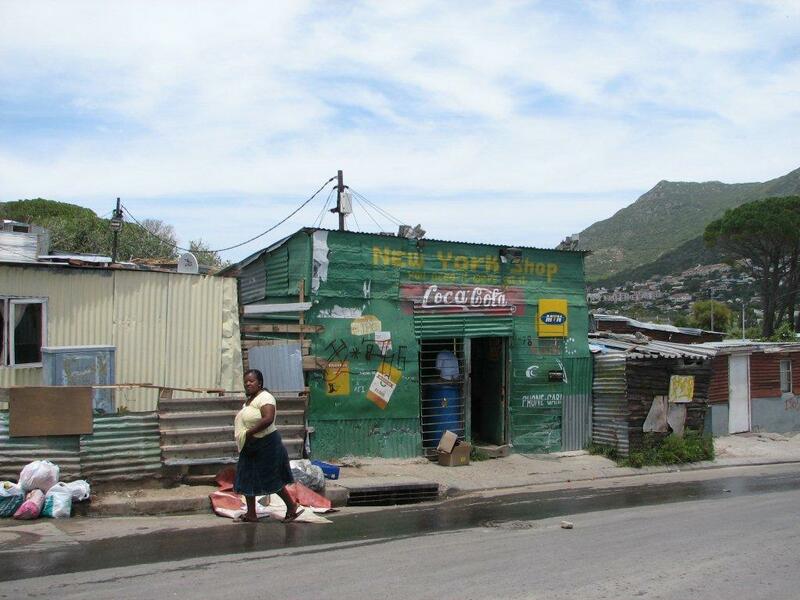 Local township called Imizamo Yethu located in the Hout Bay area in Cape Town, South Africa. The home had some major geological conditions that made the design of the home very difficult to execute. There is a beautiful view on San Clemente and the ocean beyond from the south side of the home, and so the home was built around this aspect. Concepts of privacy versus the public interaction with the rest of the community was explored, along with the relationship with the surrounding environment. In the end design was rejected because of the unrealistic nature of the home for not following architectural guide lines. Tennent, Scott, ed. Jones, Partners Architecture: El Segundo : Designs for Words, Buildings, Machines. New York: Princeton Architectural, 2007. Print. p. 85. This is a classic two-level PRO/con installation. It is situated next to a ski-slope and includes two bedrooms, a kitchen, living and dining, and a family room. Tennent, Scott, ed. Jones, Partners Architecture: El Segundo : Designs for Words, Buildings, Machines. New York: Princeton Architectural, 2007. Print. 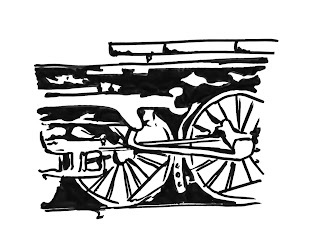 p 46. This building was inspired by the elemental nature of the site. The structure was intended to stand out on the site with a utilitarian directness. The containers provide housing for campers, a shelter for travelers, and a community space for gathering around central fireplaces in the units. In a time of unstable family structures and shifting power relations in a group environment, the agility of modern domesticity is tested with these designs. The package homes question the user to spatially express their personal understandings of domestic traditions and transactions. The homes can also be personalized to fit the needs of each family environment. Clients are able to choose different packages that make up unique components to the container homes. Tennent, Scott, ed. Jones, Partners Architecture: El Segundo : Designs for Words, Buildings, Machines. New York: Princeton Architectural, 2007. Print. p. 163-187. These homes are a response to the economic pressures on a limited landscape to the increasing density as well as the related need to maintain a unique suburban balance between privacy and the public view despite the populated space. It answers the necessity for greater ecological responsibility and takes account of the reorientation towards spatial qualities prompted by the increasing importance of the computer and cyberworld. Elov (the car of the future) is another design that goes with the home. Elov, or 'electric low occupancy vehicle' faces issues of Californians and their high congestion of traffic and the environmental problems in our society. 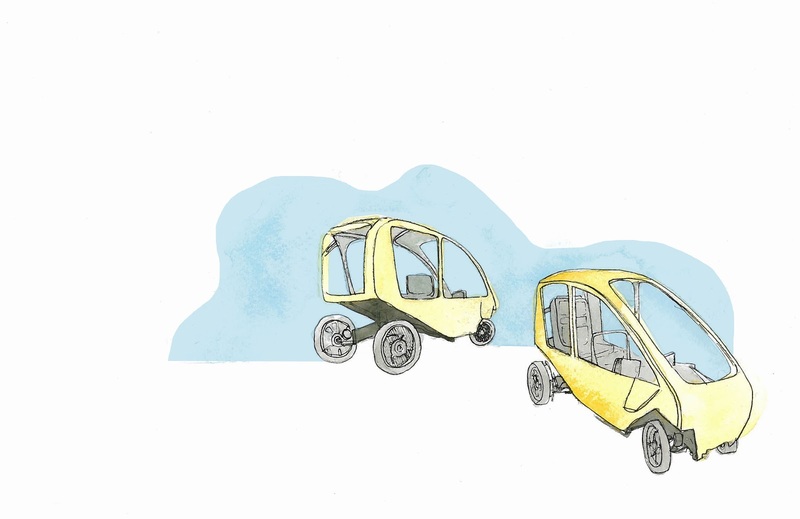 The car is light weight, small and compact, and the cars can lock together for a family to fit inside. The interest in shipping containers did not end with the primitive hut. 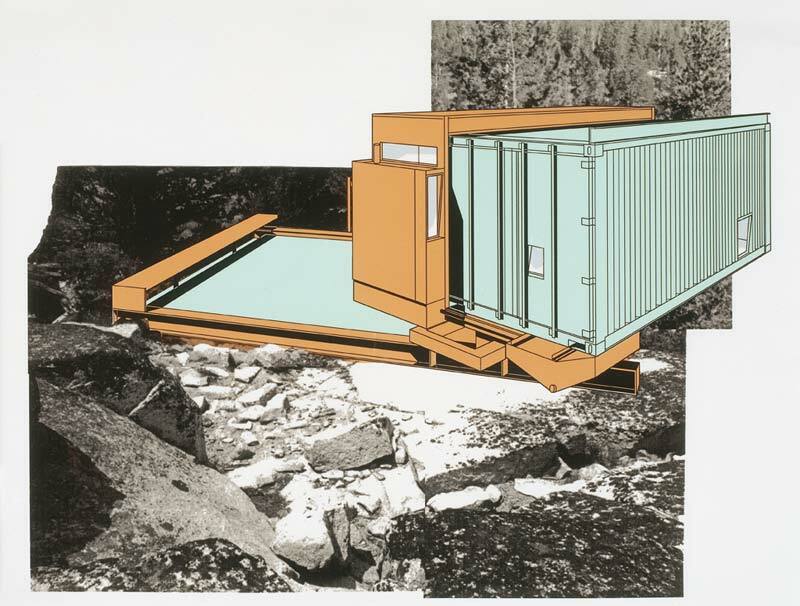 Wes Jones continued to use shipping containers in multiple projects, which he titled PRO/con (Program/container). 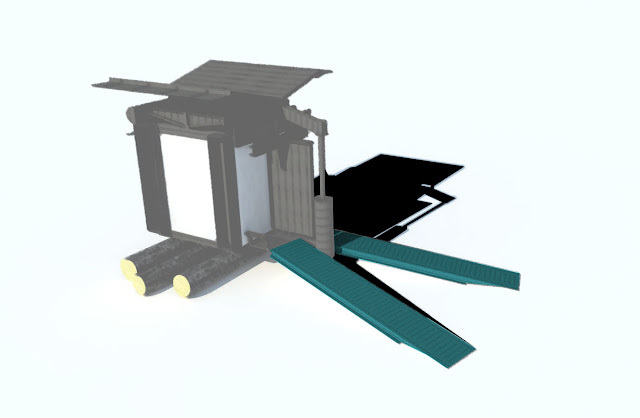 The purpose of PRO/con designs are to solve the problems related to low-cost housing in a time of mobility, therefore the use of transportable, inexpensive manufactured devices to construct a home are important to the theme. The system is based on the primary structural use of 20 ft standard ISO shipping containers. PRO/con takes advantage of the ease of transportation and storage of these containers in the designs. 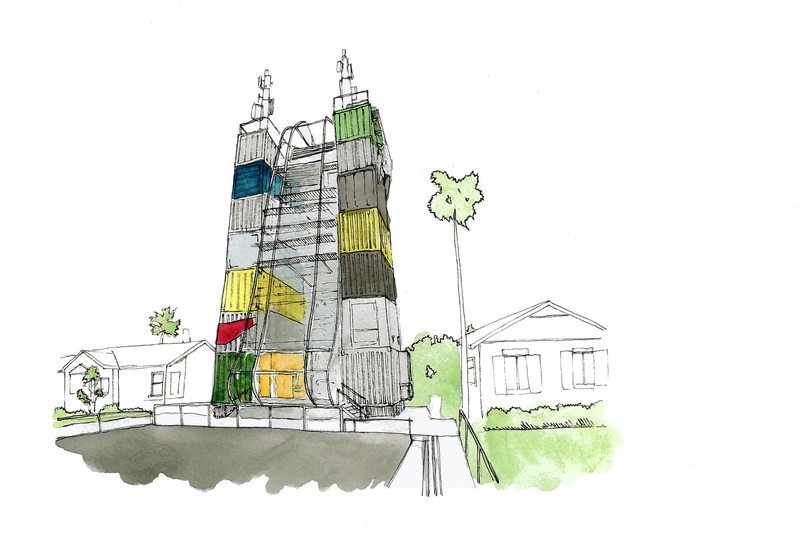 The functionality of the storage container and its construction with the rest of the home is very accurately described in el segundo: 'It is a fully pre-fabricated unit to be delivered on-site and placed on arrangement of steel dunnage (similar to what is used for anchor billboards). Dunnage transfers loads of the new structure to host the building's structural hard points. A rotating subframe and slewing ring assembly rests immediately upon this anchoring, stabilizing dunnage, and in turn supports the basic PRO/con module of two containers.' The containers include all utilities fit for a typical residential environment, including rooms for sleeping, bathing, a living room, kitchen and study. In total there are nineteen projects in the PRO/con category of Wes Jones architecture. Here we have done a brief overview of five of these projects. It is very easy to identify the similarities of these projects to the primitive hut. 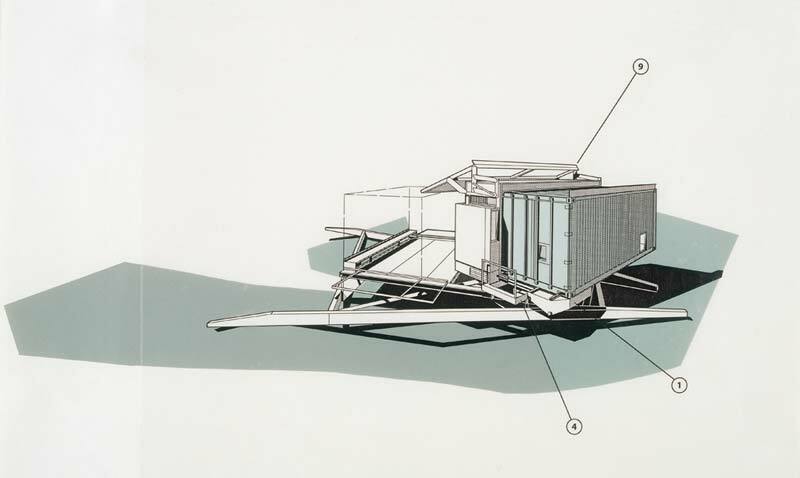 Phau and Jones' intention with their primitive hut was to design architecture for the hunter/gatherer, someone who would scavenge and then recycle materials, and find ways to heighten the use and role of machine in architecture. Shipping containers took up the base of the home, with the addition of then current day, mass produced materials such as I-beams, glass aluminium, ramps and billboards. We questioned as a group how this concept of Phau and Jones' primitive hut would translate into our current times, and how the technology, manufactured items and mass production that is evident today would replace the items used for their version of the primitive hut. Jones and Phau's primitive hut had an industrial theme to the objects used. They were items of popular demand for their time period, and we wanted to see what these objects would be like for the 21st century. 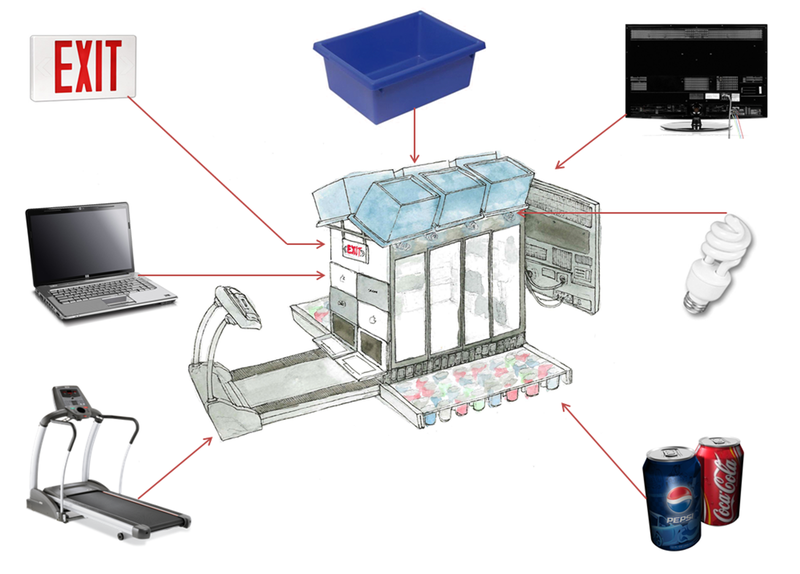 For this small personal assignment, we brainstormed ideas of objects and materials that are mass produced today. The list was very large since the technology of today has dramatically changed in the past few decades. Items like cellphones, game consoles, laptops and television screens are examples that resonate from today's society as mass produced everyday objects which weren't around before. 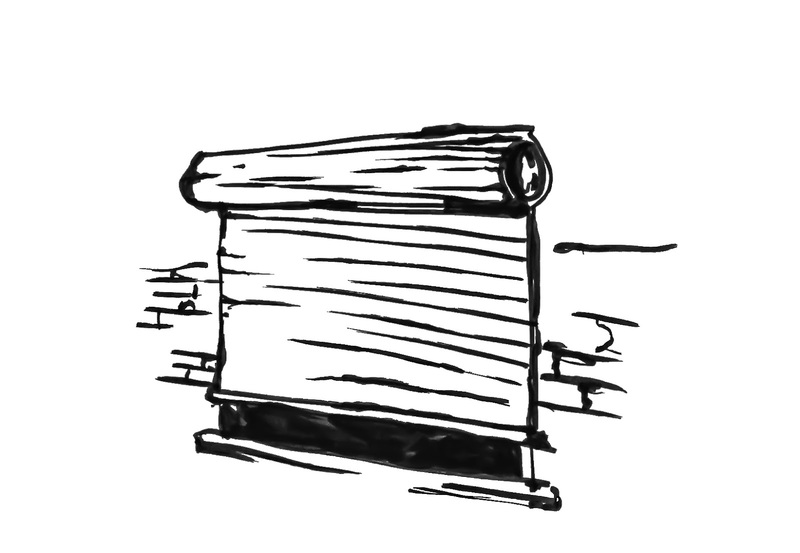 Using one of Jones and Phau's primitive huts as inspiration, I designed a modern day primitive hut out of laptops, cellphones, pop cans, plastic bins, public signage, fluorescent bulbs, gaming devices a plasma screen TV and a treadmill. 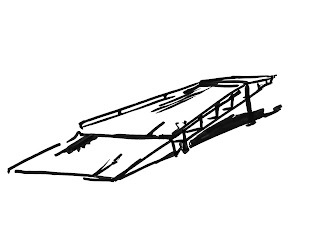 This new hut has many physical characteristics that are similar to Phau and Jones' hut, such as an overhanging attachment on the back wall, which in their case was a billboard but developed into a TV screen, a roofing component, a ramp element in the front and a box-like form in the centre. 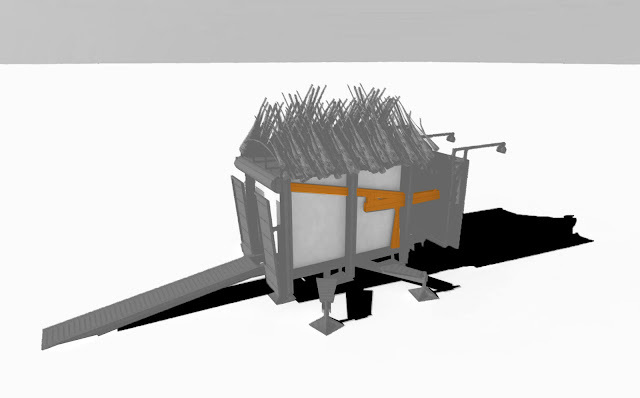 Although the times have changed there are still themes from Jones and Phau's primitive hut that can relate to our current society, and we were able to demonstrate this with this design. In 1994 Wes Jones designed a living space that was meant to take up 360 acres of forest in a property located in High Sierra, California. 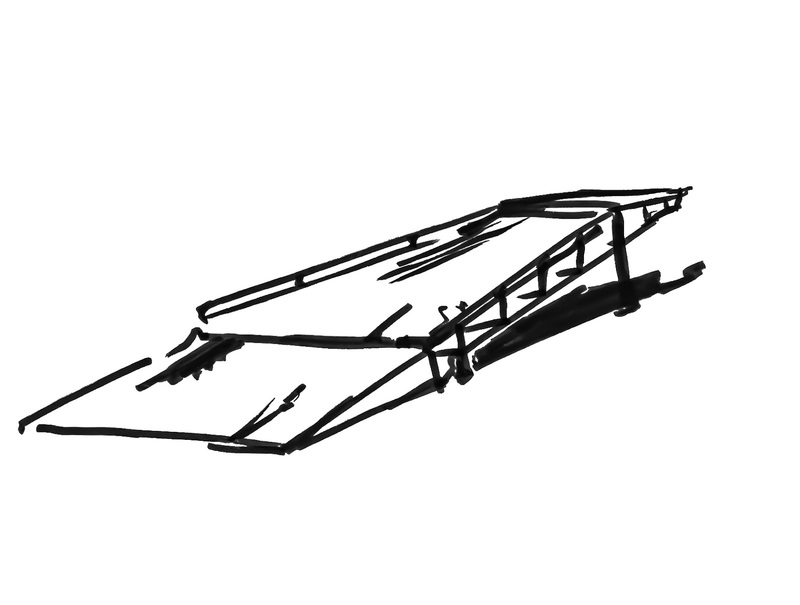 The landscape of the area required the use of some sort of standard prefabricated device; something that would be strong, durable, inexpensive, and easily transportable by helicopter or truck. The answer to these needs was a shipping container. The end result of this project was the Guest Hut, which were independant small cabins for guests, located in a forest environment. 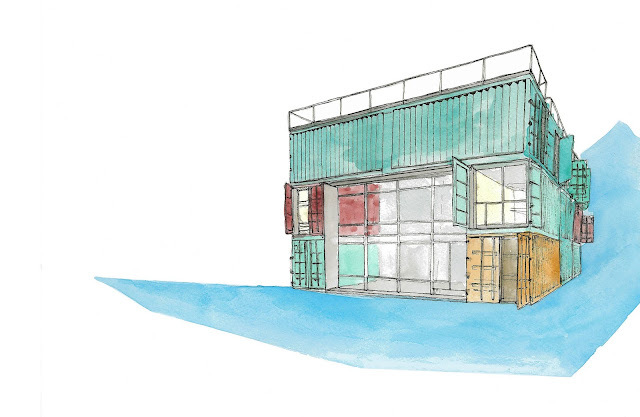 Each configuration of the container homes pertained to the environment in which it is situated. 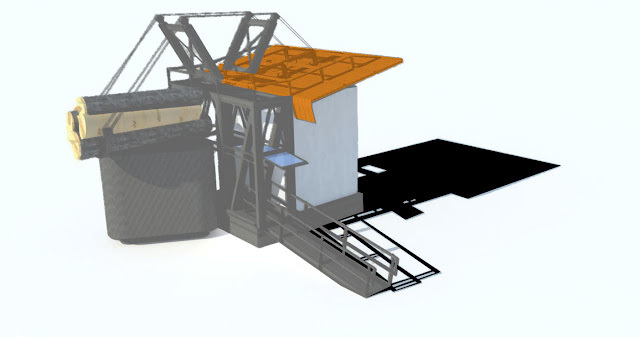 For example, the vertical elements that come from stacking the containers gives a sense of stability and security for a flat land region, where as in a steep and dangerous site the containers include overhanging elements that cover the rocky environment around. This special relationship that was designed for the building and its environment was a theory that Jones questioned later on regarding the primitive hut. He began to further question the relationship between the house and the wilderness. This inquiry of Jones was foreshadowing for his reflections on the primitive hut. 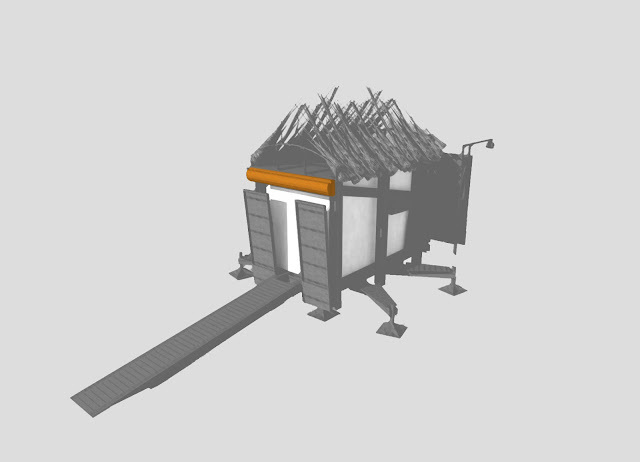 It is evident that the building has themes, such as industrial materials, that Jones uses later on in other projects, especially the primitive hut. The concept he had behind this project was very important to the transformation of the primitive hut. This project is also where the origin of the shipping container in his work came from. Jones learned the flexibilities and resourcefulness of the shipping container after working on this project, and therefore continued to stretch the object's use and design in later works. 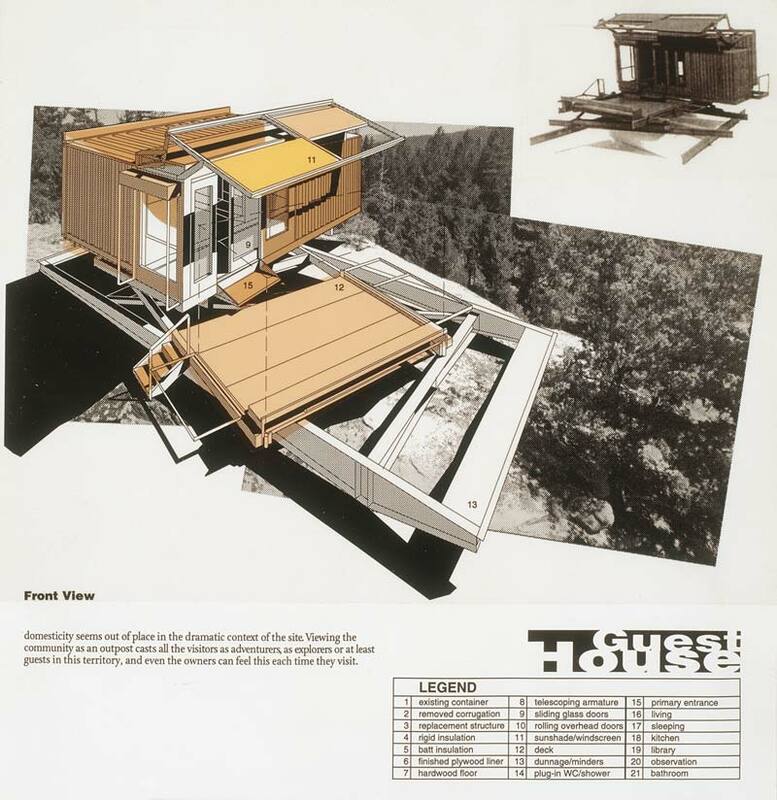 "Hesselink Guest Hut / Container House, 1994." Frac Centre. Laurent Pinon, n.d. Web. 11 Dec. 2012. <http://www.frac-centre.fr/collection/collection-art-architecture/index-des-auteurs/auteurs/projets-64.html?authID=100>. During the Great Depression, young car enthusiasts wanted to show that money was not the only means to gain automotive status and they began customizing cars, known as ‘glow jobs’ or ‘soup-ups’. It was in the 1940s that the term ‘hot rod’ became popularized. The automobiles were known for their power and performance, but were also a social statement of self-reliance, ingenuity and independence. Hot rods were born in the dry lake region of Southern California. A cult of backyard mechanics working with junkyard parts created streamlined, no non-sense racing cars for competitions. The hot rods not only had to be well equipped to compete on the courses laid out on nearby desert sand flats, but also had to be functional for everyday transport. Most early hot rods were Ford Model T or Model A roadsters as they were cheap, lightweight and readily available. These basic automobiles were stripped of all non-essential parts, including fenders, running boards, ornaments and even their windshields. This editing process allowed for maximum weight reductions and aerodynamics. Coupes and Sedans were eventually used, but needed further surgery as they were generally much heavier in weight. Hot rods were fitted with large front tires in order to achieve a higher gear ratio, and consequently higher available speeds. In contrast, the front tires were standard size or smaller, decreasing wind resistance. Louvres —rows of slots —were cut into the hood, body and rear deck lid to aid in engine cooling and the release of trapped air. If the enthusiast decided to go further, flat aluminum discs could be placed on tires for additional streamlining. In 1932, the Ford flathead V8 engines were introduced and became the most popular choice for use in hot rods. 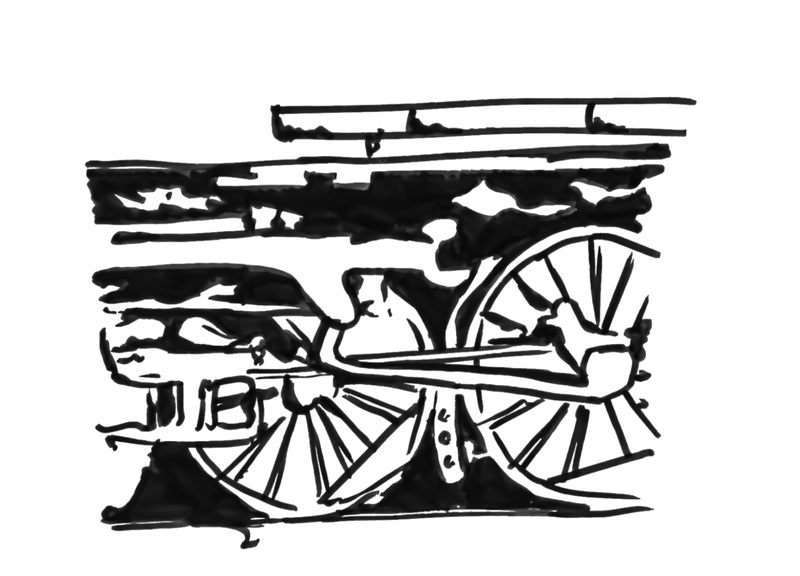 These engines were mass produced in the millions, therefore they were inexpensive and plentiful. The design of the V8 engine also allowed for easy and varied enhancements. Common adjustments included the removal of the muffler, straightening of the exhaust pipes, and the addition of multiple carburetors. World War II marked the end of early hot rodding. However, in 1945, as the war came to a close, hot rodding exploded in America and emerged as one of the most dominant post-war fads. Young men were returning home with money as well as mechanical and metal working knowledge gained from their time in the army. Young car enthusiast now found themselves with the resources to build their dream cars. Hot rodders and fans gathered in dry lakes in California, while dangerous street racing became prevalent in other parts of the country. These illegal races, coupled with late night gatherings of young hot rodders, led to a negative public view of the subculture. Hot rods, along with rock and roll, became symbolic of the darker side of American youth. To reverse negative connotations, the first hot rod exhibition was held during January of 1948. The event was held at the National Guard Armory in Los Angeles and attracted 10 000 spectators. The first issues of the successful Hot Rod Magazine, established by Robert E. Peterson, were sold at the exhibition. The establishment of the ‘Southern California Timing Association’ (SCTA), as well as the ‘National Hot Rod Association’ (NHRA) worked to further diffuse the unfavourable image, and led to a civic-mindedness and cooperative relationship with the police authorities. Racing was now limited to organized, straight-line courses, known as drag strips. Enthusiasts became increasingly serious and began building vehicles meant solely for racing, and ‘street rods’ as well as customs emerged as sub-sets of the automobile culture. By the end of the 1950s, competition was fierce and top cars were only taken out for races or exhibitions. The junkyard parts used during the movement’s infancy were no longer adequate, and as a consequence demographics of hot rodding adjusted to an older, wealthier population. The 1960s marked a rebellion against elegant hot rods and the emergence of ‘muscle cars’—plain automobiles with huge amounts of power. The gas shortage of the 1970s resulted in the smaller ‘pony cars’. However, hot rods reemerged once again in the 1980s. There were two dominant groups keeping the hot rod culture alive, those driven by nostalgia and the young, primarily latino, car enthusiasts. The hot rod culture has evolved dramatically from its birth in the junkyards or Southern California, but hot rodding remains popular today. 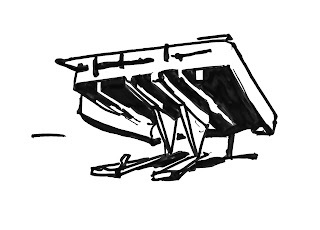 The concept of “souping-up”, prevalent in the 1930s, 40s and 50s, has served as a central inspiration for Wes Jones in his approach to architecture. The primitive huts by Wes Jones and Peter Pfau are clear reflections of the deconstructive and additive processes present during the ‘souping-up’ of a basic car body (such as the Ford Model T). In the following clip Jones describes how his strategy in constructing the Stieglitz Residence is comparable to that of ‘souping-up’ an automobile. 1. "Events in the News." State Library of South Australia. http://www.slsa.sa.gov.au/exhibitions/boland/WorldTLvertical.htm (accessed December 5, 2012). 2. Jones, Wes. "Jones, Partners : Architecture." archilab 2008. http://www.archilab.org/public/2000/catalog/jones/jonesen.htm (accessed December 5, 2012). 3. Keko, Don. "Top 10 historical moments of the 1990s - National American history ." Examiner. http://www.examiner.com/article/top-10-historical-moments-of-the-1990s (accessed November 24, 2012). 4. Keko, Don. "Top Historical Events of the 1980s - National American history ." Examiner. 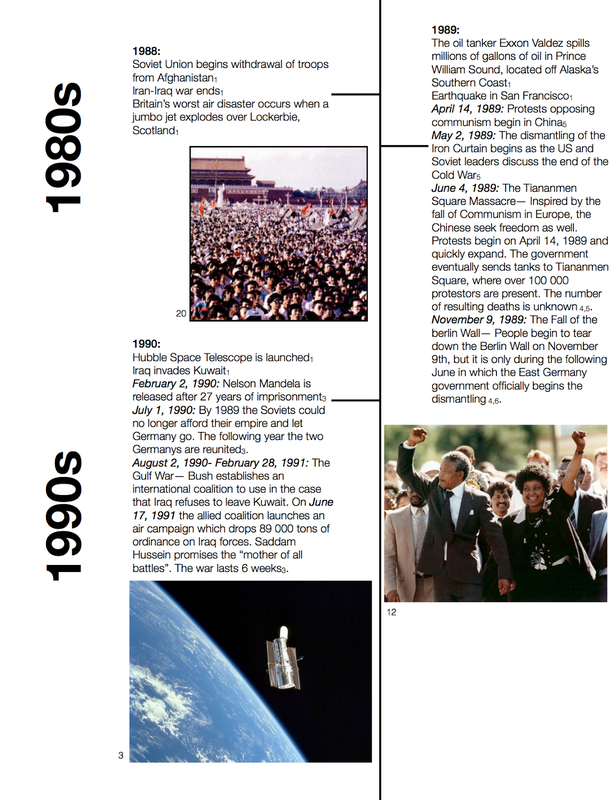 http://www.examiner.com/article/top-historical-events-of-the-1980s (accessed November 21, 2012). 5. 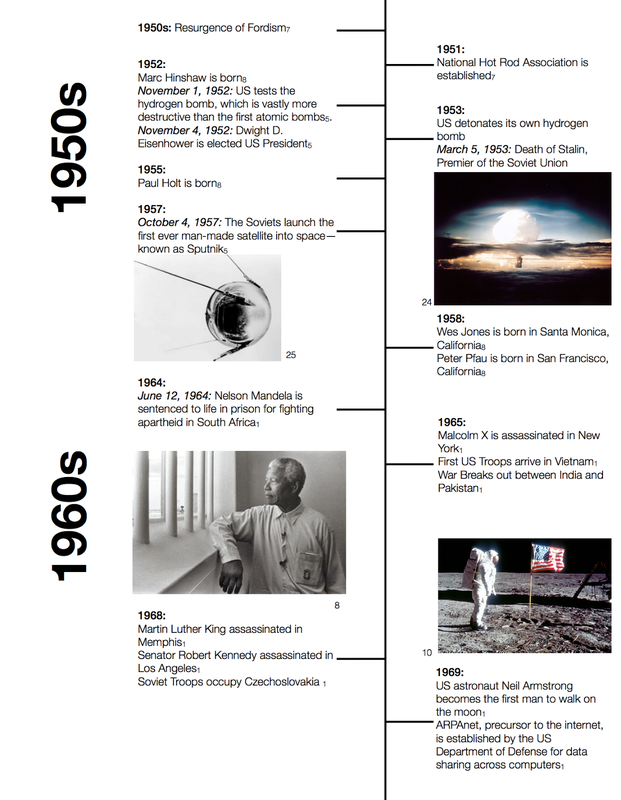 "Love, Hate & Propaganda: The Cold War - Timeline." CBC. http://www.cbc.ca/doczone/lovehatepropagandacoldwar/timeline.html (accessed November 20, 2012). 6. "The 80s Timeline." power house museum . 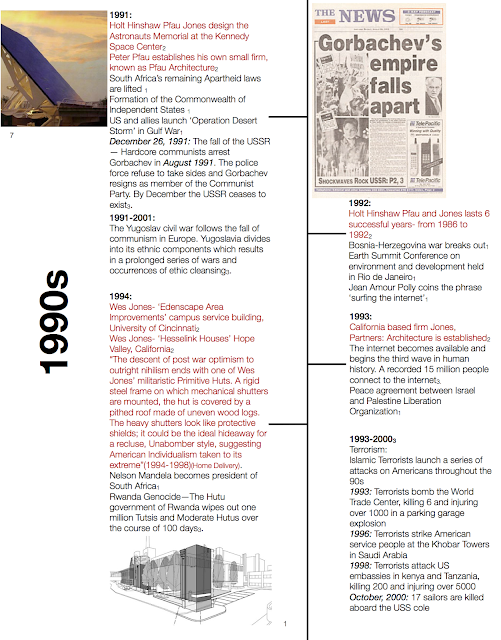 www.powerhousemuseum.com/pdf/education/80s/80s_timeline.pdf (accessed November 20, 2012). 7. Warde, John. "A Short History of Hot Rods ." MSN Autos. N.p., n.d. Web. 10 Dec. 2012. <http://editorial.autos.msn.com/article.aspx?cp-documentid=435974>. 8. "Wes Jones for Holt Hinshaw Pfau Jones Architecture." San Francisco Museum of Modern Art (SFMOMA). http://www.sfmoma.org/explore/collection/artwork/3571?artwork=3571 (accessed December 7, 2012). 1." ARCHIVE." JONES,PARTNERS;ARCHITECTURE. http://www.jpa-archive.info/ (accessed December 8, 2012). 2." The Thatcher era, three decades on | Politics ." The Guardian . http://www.guardian.co.uk/politics/gallery/2009/may/04/margaretthatcher-conservatives (accessed December 8, 2012). 3. "20th Anniversary of Hubble Telescope Launch." Man with open eyes. http://manwithopeneyes.blogspot.ca/2010/04/20th-anniversary-of-hubble-telescope.html (accessed December 8, 2012). 4. "9/11: The 25 Most Powerful Photos | Photo Gallery ." Yahoo! News. http://news.yahoo.com/photos/9-11-the-25-most-powerful-photos-slideshow/ (accessed December 8, 2012). 5. "Apollo-Soyuz Test Project ." Multimedia Diagrams. 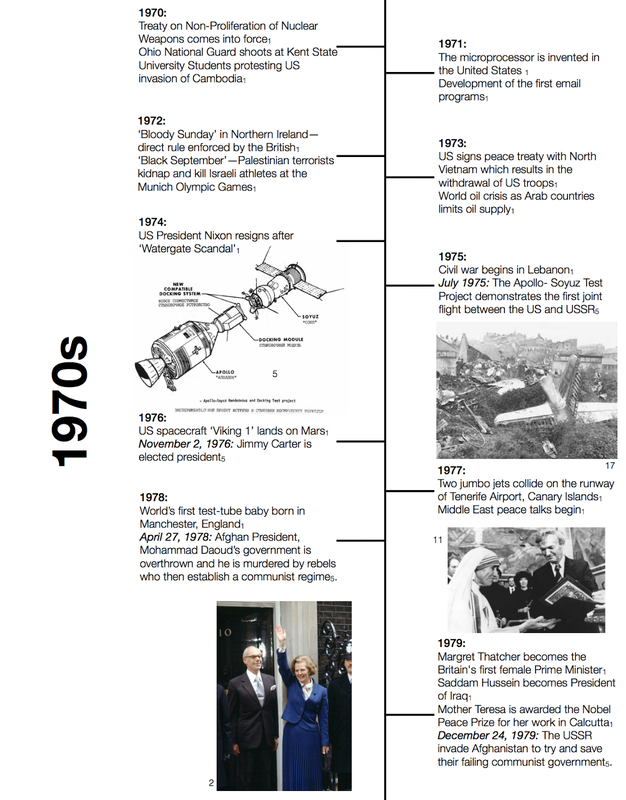 spaceflight.nasa.gov/history/shuttle-mir/multimedia/diagrams/astp/astp-2.htm (accessed December 8, 2012). 6. "El Segundo ." Builders Booksource. 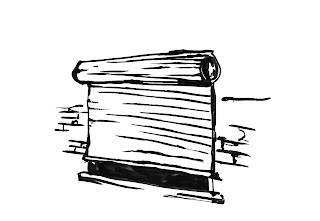 www.buildersbooksource.com/cgi-bin/booksite/23520 (accessed December 8, 2012). 7. "Fairfield Company to Add Columbia Crew to Astronauts Memorial Space Mirror." Creative Edge Master Shop. www.cec-waterjet.com/Articles/Ottumwa-Courier-2003-07.html (accessed December 8, 2012). 8.Hayat, Umar. "Top Ten Little-Known Nelson Mandela Facts Nelson Mandela in Prison“ Bewajah." Unnecessary but Necessary. http://www.bewajah.com/2012/03/14/top-ten-little-known-nelson-mandela-facts/nelson-mandela-in-prison/ (accessed December 8, 2012). 23. "Hot Rod Exposition ." Kustomrama. http://www.kustomrama.com/index.php?title=Hot_Rod_Exposition (accessed December 11, 2012). 9. "Jones, Partners : Architecture." archilab 2008. http://www.archilab.org/public/2000/catalog/jones/jonesen.htm (accessed December 8, 2012). 24. 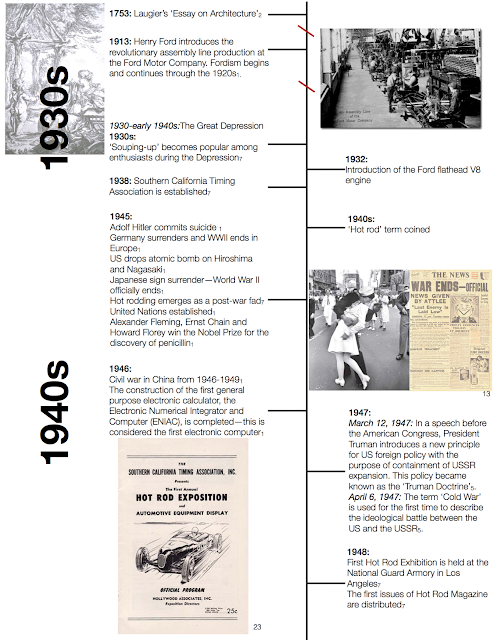 "Love, Hate & Propaganda: The Cold War - Timeline." CBC. http://www.cbc.ca/doczone/lovehatepropagandacoldwar/timeline.html (accessed November 20, 2012). 10. "Meeting the men on the moon." University Observer . http://www.universityobserver.ie/2012/10/31/meeting-the-men-on-the-moon/ (accessed December 8, 2012). 11. "Mother Teresa." UPI.com. http://www.upi.com/topic/Mother_Teresa/ph5/ (accessed December 8, 2012). 12. "Nelson Mandela- ANC ." African Art. http://www.ezakwantu.com/Gallery%20Nelson%20Mandela%20-%20Madiba.htm (accessed December 8, 2012). 13.Priya, CJ:. "V-J Day, Times Square, ." Photo Gallery - News Photos | Showbiz Pictures | Sports Gallery | Events Pics | Unique Photos | Social Images. http://photos.merinews.com/newPhotoLanding.jsp?imageID=1308 (accessed December 8, 2012). 14. "San Jose Repertory Theatre :: BBI Engineering." BBI Engineering. http://bbinet.com/index.php/portfolio/theaters/sjrepertory/ (accessed December 8, 2012). 15. "Soviet Air Defense Forces | Voices in Wartime." The Documentary Film "Voices in Wartime" | Voices in Wartime. http://voicesinwartime.org/category/tag/soviet-air-defense-forces (accessed December 8, 2012). 16. "Space Shuttle Columbia STS-087." Aviation Spectator . http://www.aviationspectator.com/image/photos/aerospace/nasa-space-shuttle-sts/space-shuttle-columbia/space-shuttle-columbia-missi-583 (accessed December 8, 2012). 17. "The Crash- Canary Islands." The Black Box. theblackboxspeaks.org/crash.html' (accessed December 8, 2012). 18. "The Fall of the Berlin Wall Pictures." CBS News. http://www.cbsnews.com/2300-500283_162-5554834.html (accessed December 8, 2012). 25. "The Sputnik Program, History 135." Nova Online . http://novaonline.nvcc.edu/eli/evans/his135/Events/Sputnik57/chronology.html (accessed December 11, 2012). 19.chhistory.com/2009/04/02/this-day-april-3-1986-ibm-introduces-the-first-laptop-computer/ (accessed December 8, 2012). 20. "Tiananmen Square Massacre." Facts and Details. factsanddetails.com/china.php?itemid=77 (accessed December 8, 2012). 21."robbrillresidence2." thefunambulistdotnet. thefunambulistdotnet.files.wordpress.com/2010/12/wesjones-robbrillresidence2.jpg (accessed December 8, 2012). 22. "Biography of Ronald Reagan." UMKC School of Law. http://law2.umkc.edu/faculty/projects/ftrials/hinckley/REAGAN1.HTM (accessed December 8, 2012). University of Waterloo School of Architecture. Simple theme. Powered by Blogger.